The fitness world consists of a magnificent multitude of modalities, methods, and techniques. So many spectacular paths to self improvement exist that it can be hard to know which road to take. Over the course of my 30 years of strength training, I've lifted weights, slung sandbags, exploded with kettlebells, and raged on machines. But my fitness journey began with calisthenics, and after many years, it's where I've landed for good. Why? There are numerous aspects of bodyweight strength training that appeal to me. There's the elegant minimalism, freedom, empowerment, and self-reliance, not to mention the full-body harmony intrinsic to each exercise. It's interesting that calisthenics is often referred to these days as a modern "movement," because nothing could be further from the truth. In fact, bodyweight training has been around since the dawn of humanity. It is the oldest—and, I think, the noblest—form of exercise. Way before there were gyms or systemized weights, our bodies were not only the best way to train, they were the only way. It's no wonder so many of us get inspired by this phenomenon! 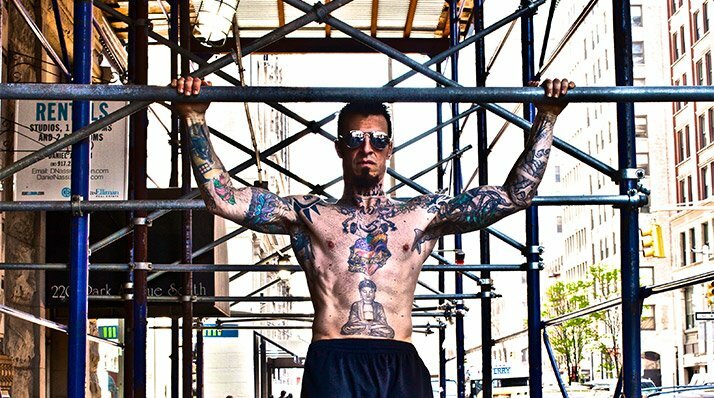 As a freak and geek of fitness, I know for a fact that I am a calisthenics devotee. Check out this list and see if you are, too! You're walking down the street, minding your own business, when you come across a construction site. There are men at work, fabrication crews, and all kinds of construction equipment. But instead of seeing scaffolding, ladders and support structures, all you can tune into are all the things you could be hanging from or pulling yourself over! Instead of seeing scaffolding, ladders and support structures, all you can tune into are all the things you could be hanging from or pulling yourself over! We all know that weight training in any capacity toughens up your muscles, bones, tendons, and ligaments, but plenty of people can get strong without ever giving much thought to the skin, your body's largest organ. Not me! 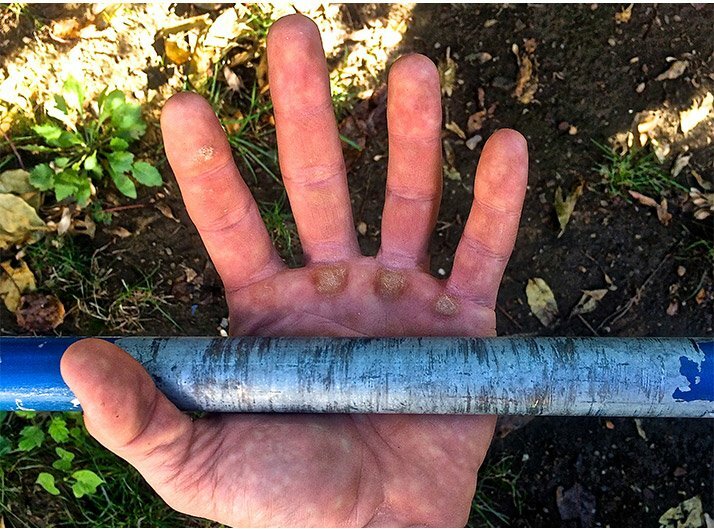 A telltale sign of the calisthenics body is the look of the hands! A varied diet of push-ups, pull-ups, and dips compel your hands to take on this signature appearance of calluses upon calluses. 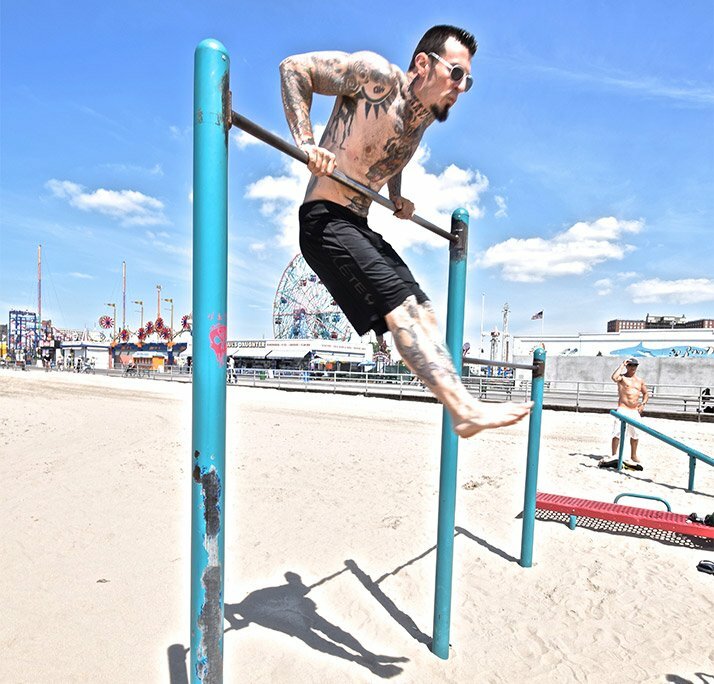 Nothing toughens you up inside and out like calisthenics! A varied diet of push-ups, pull-ups, and dips compel your hands to take on this signature appearance of calluses upon calluses. Hey, we all find ourselves in a gym now and again. What we do when we get there is what matters. When you go to the gym and see the cable cross-over machine, you don't for a moment think of chest flies. 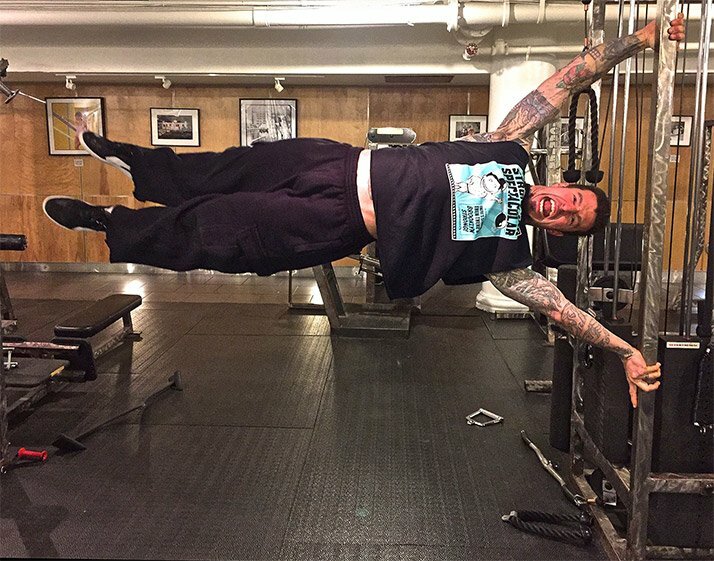 Instead, you think, "Human flag!" We all find ourselves in a gym now and again. What we do when we get there is what matters. Some heavy lifters are going to hate me for this, but I have to call it like I see it. When your main goal is to move as many external pounds as possible, that goal will become more accessible the heavier you get. Muscle or fat—both can sometimes help. But when your motivation is to maneuver yourself around your environment with power, precision, and grace, your pound-for-pound strength is what matters most. This concentrated strength is what leads to clapping pull-ups, plyo-pistol squats, and mighty muscle-ups. When your motivation is to maneuver yourself around your environment with power, precision, and grace, your pound-for-pound strength is what matters most. Sure, you can't name the original 13 US colonies you learned in seventh grade history class, but you have no problem rattling off 13 push-up variations off the top of your head. Ready? Go! 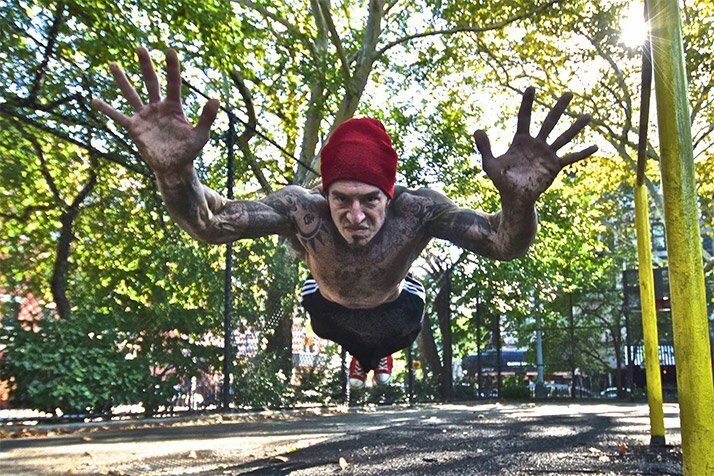 Wide push-up, narrow push-up, one-arm push-up, clap push-up, superman push-up, hinge push-up, uneven push-up, incline push-up, feet apart push-up, diamond push-up, archer push-up, dive-bomb push-up and iguana push-up. The list doesn't have to end there. You can't name the original 13 US colonies you learned in seventh grade history class, but you have no problem rattling off 13 push-up variations off the top of your head. Yes, the bench press is a great exercise. I myself did it regularly for the better part of two decades. But at this stage of the game, I can honestly say that it isn't a part of my programming whatsoever anymore. In fact, I haven't benched for years, and I'm in better shape for it! But gimme a traffic light or street sign and I'll give you pull-ups, hand balancing, hanging knee raises, and bar levers! Gimme a traffic light or street sign and I'll give you pull-ups, hand balancing, hanging knee raises, and bar levers! The calisthenics fanatic's idea of a complete, well-equipped gym consists of two things: a body and its environment. As the distinctions between intense training and having fun grow more dubious, your workouts turn into playtime. You have a blast, and blast your lats at the same time! There's a time and a place for both types of bars, but let's face it: A pull-up jam is a lot cheaper than heading out for drinks. Work hard, play hard, I always say. In the case of a calisthenics meet-up, they're one and the same! The calisthenics fanatic's idea of a complete, well-equipped gym consists of two things: a body and its environment. If you have any other tell tale signs that you're a calisthenics fanatic, let me know in the comments below. Keep training hard and keep the dream alive, my friends.